SEAS & St. Thomas Aquinas @ WYD Rio '13 | "Go and make disciples of all nations!" "Go and make disciples of all nations!" So…I think I forgot to post this video when I was busily posting all the videos I had. Basically, one of the fruits of waiting in line for the bathroom at Copacabana Beach for the prayer vigil is…Pope Francis passing by. We were in line for pay-to-use restrooms, but we wanted to get over to the porta-potties so we didn’t have to pay. Unfortunately, the way to get to them was blocked off because Pope Francis was on his way to the prayer vigil. I had Tyler sit on Mark’s shoulders with my camera to get this video! 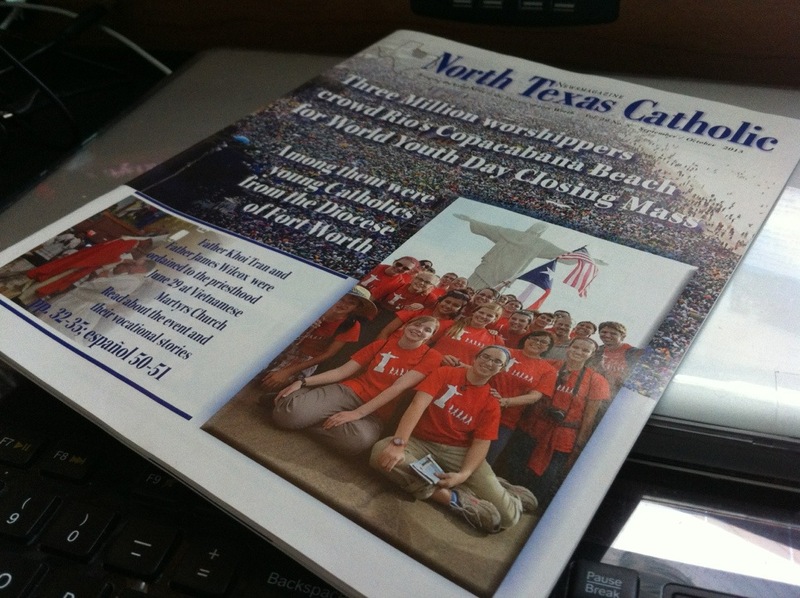 The North Texas Catholic is our diocesan newspaper-now-magazine. Yeah, I’ve mentioned before that while we were in Rio, a few of us were interviewed by local reporters, reporters from elsewhere in the world, and even NPR. But, when we got back, NTC did a story on us and our trip. They requested photos from me, and I didn’t expect that a picture from my camera (not taken by me, but our tour guide) would make the front cover! They even did a full-page story, and it is on page 23 in this edition of the North Texas Catholic. But you can find it online. Here: “World Youth Day 2013 in Rio gave local young adults a sense of Pentecost”. Pretty cool stuff. Do check out the rest of this blog for more stories, pictures, videos! It’s been a few weeks since I was in Rio de Janeiro for World Youth Day. I had a rough time upon returning! I got back home in the middle of the afternoon Wednesday, a few days after the closing Mass. The very next day, I went to work. That Thursday and Friday was rough because I hadn’t yet returned to a normal sleeping schedule. And because I make some ridiculous Catholic decisions sometimes… that Friday after I returned, I went to a young adult Catholic conference at a nearby parish! Had that all weekend! In brief summary of that conference, I liked the keynote speaker, the workshops were helpful, but more importantly, it was great for networking! So, because of the constant rain and being out and about in that rain nearly every day while we were in Rio, members of my group got sick. You know, usual cold and cough stuff. Praise God that I didn’t get sick while we were Rio-ing it up, but I definitely became sick after we returned home! Again, typical cold and cough stuff. Nothing exotic like some sort of animal flu from…I don’t know…Peru or something. So yeah, it was rough after getting back from Rio. But now that I’m recovered and have caught up on sleep (mostly), and now that I’ve had some time living a post-World Youth Day life, I’ve had some time reflecting on how it has impacted me. First, let’s get the usual awkward question out of the way. But let’s have a prequel! A flashback! Lol. I gave her the shortest answer I could, given the circumstances (I mean, shoe buying is serious stuff) while still being truthful. I replied with, “haha, we’ll see”, and she gave this weird look. We then carried on with our tax-free shoe shopping sprees. Now that I’ve been to World Youth Day for the first time and have had some time to let those experiences marinate in my memory and soul…my answer to that question remains the same from before World Youth Day. But here in this blog post, I am able to offer more explanation since I’m not in the process of purchasing tax-free shoes for some crazy out-of-country trip a year later. My answer? Ultimately, what makes us the happiest and most at peace (in a profound way, though not without trial and suffering out of love) is living out life according to how God created us to be. He calls us to live our lives in various states and as Catholics, we call these states in life as single, married, or religious life whether as a brother/sister, monk/nun or priest. But it takes careful reflection, prayer, and discernment with God’s help to figure out which of these states of life He’s calling us to be that will bring about our greatest joys and peace. So, the short of it is…I’m currently single, but open to the idea of religious life or married life. One of them, I desire more because it attracts me more. But I think the best way I can describe where I am in all this is that I’m in an ice cream parlor with only enough money for 1 scoop of ice cream, and the two available flavors are both very good. But I keep coming back to the original flavor that looked good to me. And I’ll leave it at that for this blog post. In summary, World Youth Day did not all of a sudden compel me wanting to be a priest. Or religious brother. Definitely not nun or sister =P. But I haven’t ruled the religious option out. What World Youth Day did help me regarding religious life is gaining a better appreciation for those who have already answered that call. World Youth Day was chock full of priests and religious! (In fact, remember that my group cheered every time we saw one! And we had a friar with us too!). Without a deeper understanding of who they are and for what purpose they serve, religious people in the Catholic Church seem like a bunch of suppressed but holy individuals who do nothing but pray all the time. It’s easy to forget that they are just normal people. Granted, they’ve chosen a life that is radically different than our modern understanding on how to live life. They do not live for their own sake, and they have sacrificed life’s greatest things not because those things are bad, but because they are really good. And that’s a beautiful. Hence, we cheered. Not only that…but…there seems to be a rise of friends in my proximate circles who are pursuing the religious life, and I can’t help but celebrate their decisions! Now, to the meat of why I originally wanted to do this blog post. 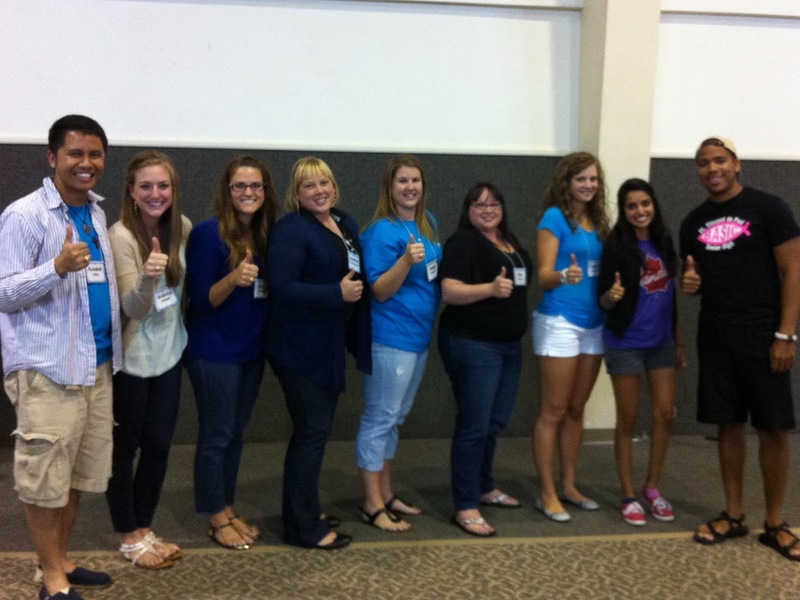 How did World Youth Day impact me? I don’t know that it really did anything truly revolutionary for me. Some people come back from World Youth Day truly changed and greatly convicted to make life-changing decisions. So, as an example, while I didn’t come back from World Youth Day wanting to become a priest, one of my second cousin’s came back from WYD Toronto wanting to become one. From what I heard, he went through with that and is currently in seminary. One of my favorite Catholic speakers and apologists, Matt Fradd, had a deep conversion moment when he went to WYD Rome 2000. And, after some digging around, I’m sure it will be easy to find stories of people who come back from World Youth Day drastically changed. And more power to them for that! But that’s not how I left World Youth Day. First, World Youth Day reminded me that I have grown lax in my day-to-day practice of my Catholic faith. Our group leader (and I love that he makes us do this) makes it a point that we try to make Mass every day any time we’re on pilgrimage. We were supposed to have a priest with us so we could conveniently have Mass, but he had to back out of our trip at the last minute. Instead, we attempted at going to Daily Mass at various parishes close to our hostel in Rio. Daily Mass used to be something that I could make once a week, but work has been so terribly busy over the past year that it’s been difficult to do that. Therefore, it was refreshing to encounter God through His Word and His Body in the celebration of Mass throughout the week while we were in Rio. In addition to going to Mass every day (or attempting to, since we didn’t make it every day), we prayed the Liturgy of the Hours every day! Like, we packed (Shorter) Christian Prayer books and 4-volume sets with us! And praying the Psalms at certain hours of the day is a great way to sanctify the day in union with the rest of the Church because the Liturgy of the Hours is the 2nd official prayer of the Catholic Church (1st being Mass, 😉 ). Daily Mass and Liturgy of the Hours were things I kept up with for a while in the past few years, but I stopped due to being busy…not devoting the time… etc. In addition to those, we had opportunities to go to Adoration throughout the week. I also used to go to Adoration on a consistent, once-a-week basis, but lately it’s been super difficult due to my busy work schedule. And that’s a shame, because spending time adoring our Lord in the Blessed Sacrament is one of my favorite ways to pray. In Rio, it was really nice to return to our usual church to spend time in Adoration, usually after having a hectic morning and lunch. And then there was that time we had Adoration with Pope Francis and 3+ million of our bros and sisters. That was something. Really, our whole time in Rio for World Youth Day was an immersion in Catholic prayer life through things that are not new or foreign to me because I used to do these things consistently. But by having these opportunities at World Youth Day, I was able to engage in these prayer experiences consistently once more that are easily accessible and doable back at home. So, since getting back from Rio, I’ve at least restored praying Liturgy of the Hours (at Night, at the very least). Still working on how I can make it to Daily Mass and Adoration consistently again… and a daily Rosary, too. Secondly, World Youth Day showed me what joy in being Catholic looks like. Yes, but on a grand scale! Through a worldly lens, it becomes exceedingly perplexing as to why anyone would A) want to be Catholic, B) be a Catholic and spend lots of money to travel across the world to a meeting place where the Pope will be, and C) be Catholic and be joyful about it. And yet, from the moment we were on our way to Rio at the beginning…it was evident that this World Youth Day thing is a big deal. And I began to savor what it all meant during our first day in Rio. That first day, we were warmly/enthusiastically welcomed by Brazilians, met so many others, sang songs, danced in the streets, photos taken, trinkets exchanged, smiles, laughter, and just pure joy! The prevailing theme throughout the week was encountering people from all over the world and the Church and sharing our joy in being Catholic! I mean, it’s not the same kind of joy that you’d find in Rio a year from now at the World Cup. That is a passionate, competitive joy and rivalry out of love for fútbol. The joy expressed at World Youth Day stems from this unity we as Catholics have in our faith because our faith is in Christ. As much as I would love this explanation of joy to be longer than the previous explanation on how I’m a lazy Catholic, I don’t know how to say in words the joy that I experienced and saw firsthand during our trip to Rio. It’s one of those “you had to be there” sort of things. And then, on top of that…there was a plethora of religious people present and they too shared in our expression of joy! And we, my group, were often overjoyed in just seeing a priest or nun (and others) walk by! So yes, World Youth Day showed me what joyful Catholicism looks like. And that’s great because even before World Youth Day, I was already joyful in being Catholic, but now it is nice to know that I’m not the only one, haha. After World Youth Day in Rio, I feel more comfortable in sharing that joy with others with no discrimination whether Catholic or non-Catholic. Lastly, this World Youth Day inspired me to have an excuse to travel the world every few years. And if I start saving for the next World Youth Day after the previous World Youth Day…then… I should be okay. Just to name a few, it’s been in the Philippines, Denver, Cologne in Germany, Sydney, Toronto, Madrid, Buenos Aires, etc and of course Rio De Janeiro. Come at me, Krakow 2016! YOU ONLY POLAND ONCE! 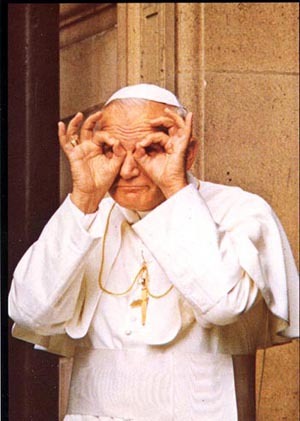 Blessed Pope John Paul II is impressed. In summary, I had a really positive experience at World Youth Day in Rio De Janeiro. While it didn’t do anything totally revolutionary for me, I had a blast and such a blast it was to share these experiences with my fellow pilgrims from SEAS and STA and 3.5+ million others. I now have a better idea of what it means to be part of the universal Church united in Christ like I expected I would. And I definitely had all these bonus experiences like seeing Pope Francis in unique ways, making friends with people from all over the globe and so much more. Man, I feel like I could blog a lot about my experiences. …so maybe I blogged nearly every night/early morning of our trip to Rio on behalf of my group, including the pre-Rio retreat that we had. It also served as a way to let our family and friends know that we didn’t get caught in Brazilian riots or other perilous foreign affairs. Whew. This was a long blog post. The moment that you probably forgot you were waiting for…. pictures from our SEAS/STA pilgrimage to World Youth Day are now online! While I did post pictures to this blog that highlighted various moments during our adventures, there are still a lot of great pictures that didn’t make it to this blog. Because of Google+’s limit of 1000 pictures per album, I have two albums to share with you all. A little over 1200+ pictures! What’s nice is that Google+/Picasa let’s you easily look at them all. Enjoy! And thanks for following this blog! Monday night after Copacabana-ing and Sugar Loaf-ing…we came back together for a very cheesy, pizza dinner. After dinner, Gabe and Jason invited our seminarians, our Franciscan friar, and the UK group’s priests to come talk to us about their vocations stories. It’s always interesting to know how Catholics living a religious vocation of some sort arrived at where they are. After all their talks, there was some Q&A for further explanations about vocations. If you’ve been following this blog…you’ll remember that on Monday before we left, we split up between those who wanted to go to Copacabana Beach and those who wanted to the Sugar Loaf mountains. I went with the group that went up to Sugar Loaf. Here are some videos from riding the cable cars and the views seen from up top. Don’t mind me being an enginerd. Lol at our commentary. Some dramatic music courtesy of Carisa. Sunday night, after all the events at World Youth Day ended with the closing Mass… we decided to just chill in the hostel. At the time, it was just and our new friends from England. We invited them to pray Night Prayer with us and then Br. Timothy initiated a nice little praise & worship session. It was really awesome sharing these moments with everyone like this! It was just about to be 10PM, which is when the hostel wants us to be quiet so we don’t disturb the neighbors. Br. Timothy wanted to do one more song…”Set Afire” …but then it ended up being about 13 minutes long. Totally didn’t ask for it. It just….happened that way. So, apparently there was this idea to have a lot of people do a flash mob dance for the Pope. Like, downright official! Like, choreographed and rehearsed way before World Youth Day! Those Brazilians that invited us to have a dance party in the streets our first day? Yeah, they attempted at teaching us the flash mob dance! More info here at Rome Reports. So…though we were many football fields away from the stage…we still had a big screen nearby. Everyone looked precious and adorable doing this dance, haha. My favorite is Jason at the end. Man, it’s awesome being Catholic! So, if you’ve been following this blog…you know that our group got to see Pope Francis super up close because of his visit to a cardinal palace where he gave a homily and prayed the Angelus. I mentioned that Mark and I hit up the Basilica for the usual catechesis session since he had been signed up to give a testimony. Hence, we weren’t with the rest of the group staking out a spot at the palace. Borderline Catholic glee club, I know! And then testimonies happened. Mark was the last of five to go. Even though Pope Francis came to Rio at the beginning of the week (as evidenced by him passing by, in our personal experience)…the official papal welcoming was Thursday night. So, we all went out to Copacabana Beach for that event. It wasn’t nearly as crowded as it would be a few days later for the Vigil and Closing Mass. There was a request to go out to the water and get feet wet. A few went, then a crowd of us went. The waves were… pretty good! We decided to not take mass transit back to the hostel since it was only a mile away. The reason why many people went this way was because most of the bus stops were…right by our hostel. I don’t know why, but we stopped about halfway and watched as hundreds and hundreds of others pass by.